MUZAK, ANYONE? The latest from embattled Cleveland – where Rodzinski, Szell and Dohnanyi once guided an orchestra to high distinction – is encapsulated in a report from a Plain Dealer article on that orchestra’s current plight and current emergency plans, to wit (italics mine): Concerts projected as “unprofitable” will be dropped from the schedule, as will most touring. (The Miami residency, said to be successful, remains unaffected.) Programming will be largely limited to works requiring no extra rehearsal or additional musicians. REDUNDANCY: David Lean’s Brief Encounter (1945) is a small, quiet masterpiece, a Noël Coward play involving honorable middle-class people pulled back from the brink of consummation by circumstances both wise and frustrating. In the background, Rachmaninoff’s Second Piano Concerto mirrors their story with harrowing accuracy; not a note is wasted. How, you’d rightly wonder, could so perfect a small drama, with its perfect performances by Celia Johnson and Trevor Howard, be further enhanced? Or why? What’ll you bet for Previn’s next opera? How about an all-singing Citizen Kane? He could call it A Sled Named Rosebud. VIRTUOSITY: David Daniels really sounded wonderful at Disney last Tuesday: his voice clear, resonant and flexible. At his Handel’s Julius Caesar a few years ago I had reason for concern; now he is the best of our countertenors. 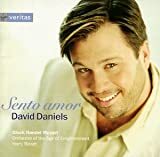 From the melting beauties of the Matthew Passion’s “Erbarme dich” to the weird rhythmic manipulations in the Mad Scene from Handel’s Orlando he dominated the stage with performances elegant, powerful and brainy. He sang with Harry Bicket’s London Concert, and that, too, was as fine as it could be. Small Baroque “authentic”ensembles have metamorphosed over the years from the soft, swoony Italian bands of the Vivaldi craze to the clattery Brits of the ‘60s with the harpsichord drowning out everything – the early days of the London Concert, under Trevor Pinnock, were thus afflicted – to the present, nicely balanced sound of Bicket’s group. He has been here often, and has been a welcome visitor every time. 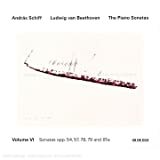 Next night there was András Schiff, continuing his cycle of the complete Beethoven Piano Sonatas to his usual sold-out house – including one sub-moron out front with a flash camera, a potent argument for arming the house staff with shotguns. I am not a Schiff admirer out of hand; in fact his performance of the murderously difficult fugue that ends the “Hammerklavier,” which Schiff took at a pace so deliriously fast that it no longer mattered whether he was landing on the right notes or on any notes, merely angered me and made it impossible to regard his performance as a musical experience. Before that I had heard quite an exhilarating performance of Opus 101, and a beautiful, relaxed saunter through the lovely slow movement of Opus 90. To my taste I found the whole of the monumental “Hammerklavier” poorly comprehended in Schiff’s uneven performance. Could it have been the rogue photographer and his flash? Schiff has reacted poorly to audience misbehavior in the past. Die Walküre (Victor M-26 &27 for you number freaks) consisted of fourteen 78-rpm discs: two Brünnhildes, two Sieglindes, two Wotans, three conductors, several huge cuts. (Fourteen 78-rpm discs can total, at most, 140 minutes; the Met’s performance under James Levine runs 244.) The first consistent Wagnerian recording, also Walküre, was the whole of Act One (M-298), recorded in Vienna just before Hitler. It was glorious then; now, on a single CD, it still is. Lotte Lehmann was the Sieglinde, Lauritz Melchior, the Siegmund; Bruno Walter conducted the Vienna Philharmonic. There hasn’t been a soprano since then who could shade the word “tränen” to draw tears as Lehmann did, as Sieglinde tells of Wotan’s visit to her wedding feast. The original plan in 1938 was to record a complete Walküre in Vienna, under Walter with the cream of Wagnerian singers of the time. The Hitler Anschluss put a crimp in that plan, with Act One and a few scenes from Act Two in the can. The project was moved to Berlin, under the undistinguished baton of Bruno Seidler-Winkler, with a few splendid singers — Hans Hotter, Marta Fuchs, the young Margarete Klose as Fricka — but no Bruno Walter to trace the lights and shadows of the “Annunciation of Death.” Out of the 20 sides of Act Two (Victor M-582) five were led by Walter with the Vienna Philharmonic; the other 15 by Seidler-Winkler, not with the Berlin Phil but with the State Opera house band. Both acts, on two CDs, make up the Naxos set; the EMI disc is of Act One only. Both, furthermore, may be hard to find, although Amazon has this efficient marketing plan though its outreach stores and has never let me down. Nobody bothered to record a complete Act Three until around 1950, when a so-so set with Helen Traubel and Herbert Janssen appeared — and soon disappeared, unable to hold its own against Wagnerian history, I’d guess. Now we are awash in Wagner, with George Solti’s epochal audio (which has, above all, the gleam of Birgit Nilsson’s Brünnhilde flashing mightily even through the heartbreak of Hans Hotter’s farewell. Some of the DVDs are visually beautiful: the back-to-nature staging at James Levine’s Metropolitan Opera, the weird but effective setting amidst plumbing and building construction at the Stuttgart Opera, Pierre Boulez hard at work at a Bayreuth hydroelectric plant but with some rather so-so singers, Daniel Barenboim, also at Bayreuth, compressed into Harry Kupfer’s austere setting. We’re in an era of Wagner interestingly staged, nowhere more so than here in Los Angeles with the fascinating symbolism of Achim Freyer’s creations – next week, Walküre, and I hear that the Valkyries ride in on bicycles! Somewhere else in California, I hear that they’re staging the Ring as if in the American Wild West. Frankly, I’d swap just one of those fancy stagings for a night of Lehmann and Melchior as those sonorous siblings. LET ME BACKTRACK, AT LEAST A FEW INCHES: Actually, the glorious Wagnerian past, whose passing I so ardently mourn, is not so much dead as simply distant. 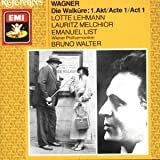 In the early days of electrical recording the London-based Gramophone Company did busy itself with Wagnerian activity, mostly based at Bayreuth but also in London and Vienna; the Walküre albums I mentioned earlier were one product. There were similar bulky sets of Siegfried, Götterdämmerung, and Tannhauser; Wagner’s son Siegfried, and even Toscanini, were rumored to take part in preparing some performances. The competing Columbia Gramophone Company had a Tristan. Most of the performances were piecemeal; various conductors and singers contributed various parts of the music dramas and the sound was, of course, what you might expect from primitive technology in the years 1928 thru 1932-or-so. What mattered, however, were the singers, who on the whole came through. Old and faint as these recordings may be, they capture a generation of Wagnerian performers, and Wagnerian performing styles, that form a document beyond price. On a two-CD Naxos set, the sound restored by the legendary Ward Marston, there is a collection of moments from Siegfried — formerly Victor M-83, 161 & 167, 20 discs, 152 minutes — cf the Met’s “complete” 253. The young Melchior trumpets forth his defiance as he forges the great sword Nothung and later achieves manhood alongside Florence Easton’s Brünnhilde; their final duet is delivered complete, and Easton’s “Heil dir, Sonne” sends shivers. Friedrich Schorr is the Wanderer/Wotan; the deep, dark eloquence of his delivery is what people still evoke when this music comes to mind. (I heard him once, from standing room in Boston; some things you don’t forget.) On Naxos there is also a Marston-restored Tannhäuser, also from those old Victor albums. 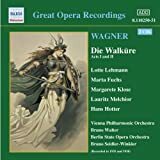 I pray that the aforementioned Walküre albums will turn up on CD; their content is priceless, with Schorr’s farewell to the Brünnhilde of Frieda Leider. Some of the sides — ten of the 28 — have another legend, the great Albert Coates conducting. Those were the days, my friends. This entry was written by Alan Rich, posted on March 29, 2009 at 8:31 pm, filed under soiveheard.com. Bookmark the permalink. Follow any comments here with the RSS feed for this post. Both comments and trackbacks are currently closed.